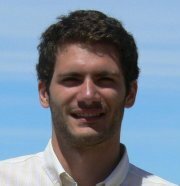 After working in the CDF experiment during my master thesis I have started this year a PhD in Freiburg, working in the ATLAS SUSY group. I am currently involved in developing a general search strategy for new physics, looking at deviations from SM predictions in all possible event topologies, to minimize the chance of missing new phenomena. I am also taking part in an upgrade of the muon DCS. My preferred OS is a Debian Linux, but if obliged I not disdain working on Windows. I have extensive experience with C/C++ and the ROOT framework, and some knowledge of python, LabView and VHDL.